Who doesn’t love a game of Uno? A classic card game for the whole family, Uno managed to become so synonymous with family card games on account of its simple rules, basic strategy, and light hearted approach to gameplay. This is the kind of game that you can be absolutely blind drunk as you play, and have a great time with. Related reading: Another must-play for card game fans, Pure Hold'em is quality stuff. Indeed, I would recommend that is exactly how you play Uno. Start out the night with poker, sure, but after a knocking down a few (okay, double figures) beers, it’s time to switch to a game that will make your brain hurt less. That’s where Uno is invaluable. Ubisoft has become the publisher to take on classic board and card games, having already taken a crack and Monopoly, Risk (twice), and Battleship. Uno is another game in this vein, and like the others it’s a lovely, but largely frills-free take on the classic game. The basic game of Uno is preserved, of course. You’ll still be tossing down cards to build up a pile in the centre of a table, with each playing trying to knock their hand down to nothing by pairing cards in his or her hand with the card on the table. There are four different colours of card, and alike colours can be paired. Or, alternatively, it’s possible to pair cards of the same number, even if the colours are different. There’s the traditional attack cards, of course, that can force your opponent to pick up cards from the deck, or skip their turn. You can reverse the order of play with a different card. Some of the most popular house rules are thrown in as optional (such as a “7” card allowing you to swap your hand with another player). Then, through this melee, someone will throw down their second last card, call “Uno”, and have a nervous wait for a round in the hope that on their next turn they’ll be able to place that last card on the table. Of course, the other players will do everything they can to stop that happening, throwing down card pick-up cards, or changing the colour of the pile in the hope that the one card you’re holding isn’t going to match the new pile colour. 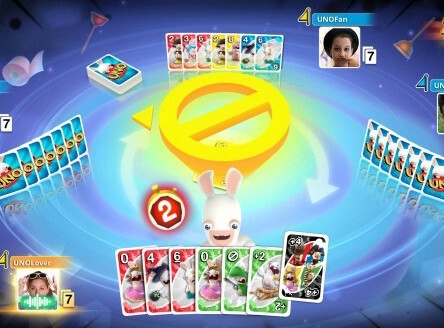 For a bit of fun Ubisoft has even thrown in a special, optional, deck, which includes its Rabbids that add even more chaos to the game. All of these gameplay options are available both online and offline, thought you’ll probably want to spend most of your time online, as the AI isn’t the most inspiring opponent. The problem with Uno is that luck weighs in heavily in game play. When you’re down to your last couple of cards, you’ll often be hoping and praying that the other players don’t change the pile deck on the table so that it’s a different colour. Because luck has a way of turning sour, I’ve played games that last for well over an hour, as all the players end up with large hands of cards, and just can’t get that last table on the table in the end. When you’re playing with friends, it matters less, because Uno is, really, something that brings people together, rather than a game designed to be played in its own right. But playing Uno online is a more competitive environment, where the game itself needs to shine, and while it is a lot of fun, there are also better games out there for that kind of experience. The presentation is lovely and clean, and never distracting. At a glance you’re able to see exactly what cards are on the table and in your hand. Those cards don’t have the equisite detail or presentation of something like Pure Hold'em, but this is not designed to be “serious” game (or have the same fetishist love of cards pas Pure Hold ‘Em); it’s bright, colourful, and anyone can pick it up without feeling overwhelmed. The real issue that this take on Uno faces is that it allows players to drop in and out of games, but does nowhere near enough to punish those that do so in bad faith. 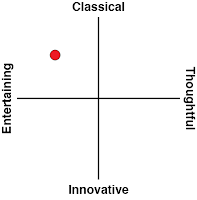 On more than a few occasions I have been playing a multi-round game, and been in a clear winning position, only for all the other players to drop out, which immediately ends my game with neither victory nor reward for playing. Meanwhile, matchmaking can drop you in the middle of a game in progress, which on the one hand is probably a good thing once the community starts to fade and there would be long wait times for a full group to get together. On the other hand I’ve been dropped into the middle of games where I’ve been in a losing position and the game ends two or three turns later, before I have any chance to do something about it. That’s just wasting my time then, and I hate wasting time. Related reading: Our review of Ubisoft's latest Risk title, also available on PlayStation 4. Finally, the no-frills nature of Uno also means that the game developers assume that you’re already familiar with how to play Uno. 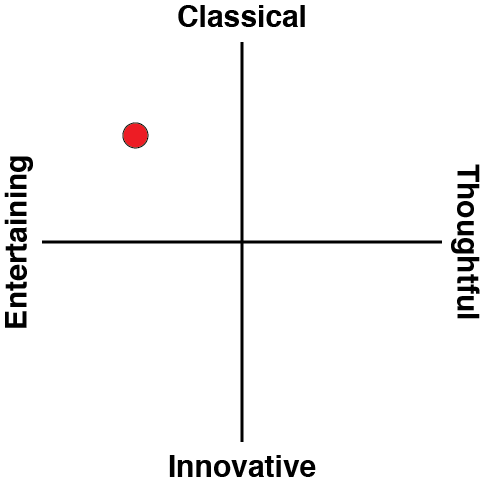 Which, let’s face it, most people interested in Uno probably are. It bears mentioning that the experience can be overwhelming for a while for a newcomer, however, though it’s a game that you can teach yourself by simply playing a few rounds with, anyway. 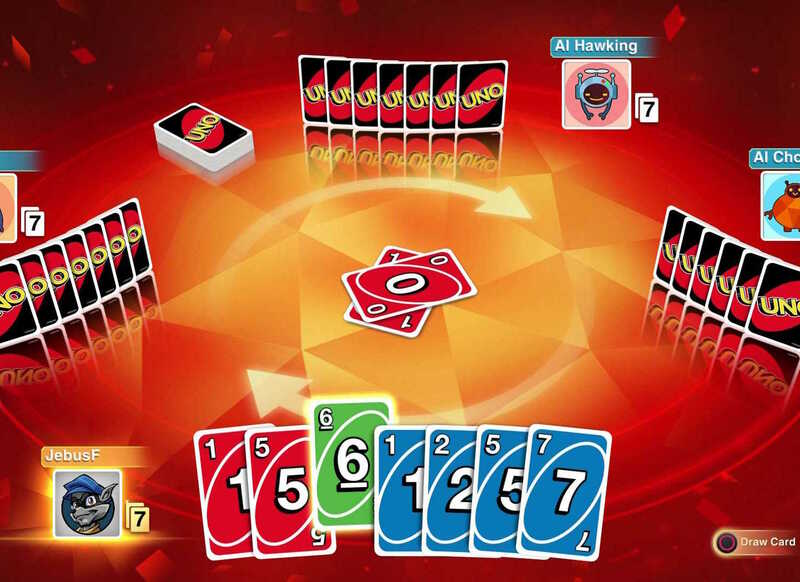 As with many classic board and card games, Uno isn’t perfect. It’s driven by luck, games tend to go overlong, and Ubisoft’s no-frills approach is workable, but workmanlike. 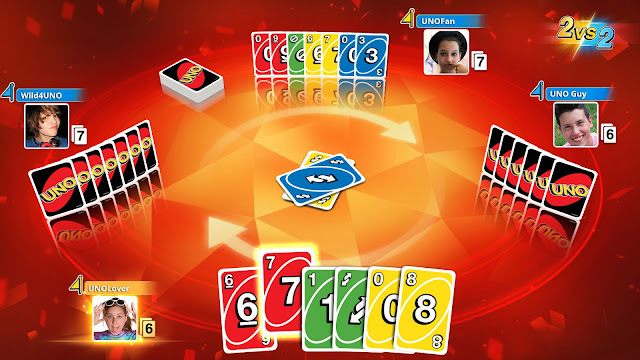 Despite that, I do really enjoy the core game of Uno in short bursts, and for people who regularly play online with family and friends (and can thus do away with the occasionally irritating random players), this is a great, low-cost way to spend a Saturday evening together when separated by distance.